The sinking type medium diver “Beach Walker 120MD” was created to efficiently scout the vast coastline. 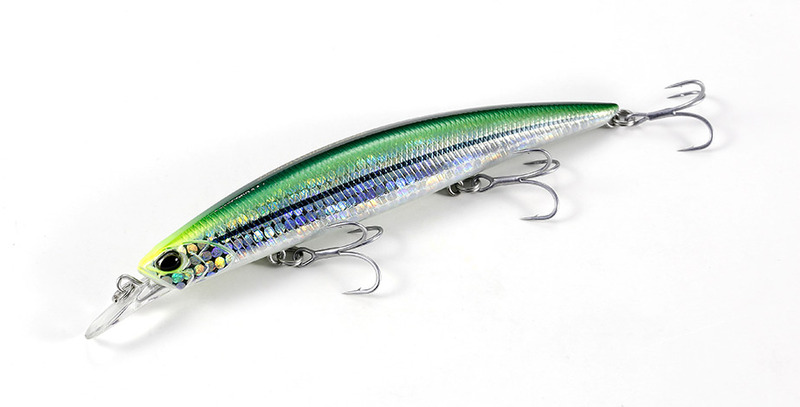 With its reliable casting ability, action balance designed to capture the complex current and a trace range more extensive than any other normal type minnow, the Beach Walker 120MD will exert its true abilities as a search bait for flounder fishing. 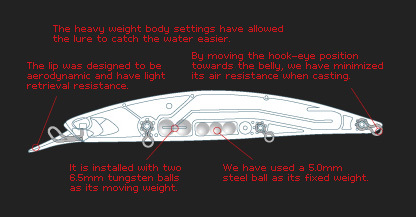 It is equipped with two 6.5mm tungsten balls as its moving weight. With its heavy weight settings and aerodynamic lip shape, anglers can experience its great and consistent castability in strong winds. We have given the lure a “wobble & rolling” action with the wobbling width being somewhat minimized. The heavy weight setting allows the body to catch the water with ease allowing the angler to trace his/her target range without the lure loosing balance in strong currents. Its swimming depth is approximately 1m. We have minimized unwanted snagging at drop-offs and have designed the lure with light retrieval resistance.